Phu Quoc island, also known as the Pearl island, is the largest island in Vietnam located off the southwest coast of the country in the Gulf of Thailand. This is a famous tourist heaven of the south that attracts many domestic and international tourists all year round. Visiting this beautiful island, you never forget to stay in charming hotels and resorts. So, today we are very happy to nominate for you the top six luxury hotels and resorts in Phu Quoc. Salinda Resort is a five-star boutique resort, located near the beautiful beach on Phu Quoc island with the charming romantic views for tourists to admire the sunset. There are 121 luxury rooms in the resort which is designed in contemporary style with the added local touch that creates a seamless transition from the inside, all whilst being surrounded by the rustic but charming beauty of the island’s natural environment. Moreover, this hotel offers three restaurants with its distinctive venue concept and an authentic Thai spa with signature treatments. 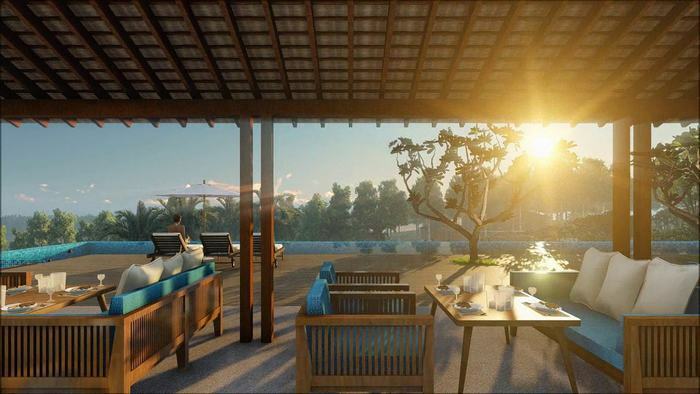 A swimming pool near the private beach brings to you the fancy looks of the breathtaking sunset. 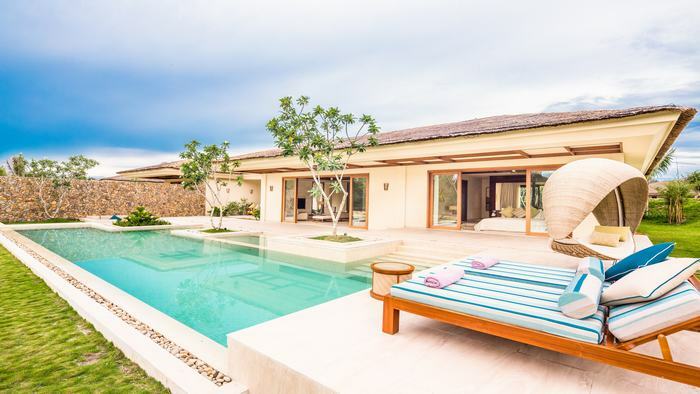 Lahana Phu Quoc resort boasts as one of the high standards of eco-friendly natural resorts in Phu Quoc which provides a spacious and luxury retreat with a large outdoor swimming pool. This resort owns a spectacular view which is the perfect combination of the ocean and mountain. All accommodations are provided with air conditioning and private terraces. The resort’s bungalows are nestled within spectacular boulders at the foot of the mountain and the cool natural wind from the ocean through the wooden balconies. Situated at Duong Dong town on Phu Quoc island, Lahana Phu Quoc resort is only 7 kilometers from Phu Quoc Airport and near 2 kilometers from Phu Quoc center night market. From the resort, you can be very easy to visit the other interesting sites of the island such as Sao beach, Phu Quoc prison, etc. Fusion Resort Phu Quoc is located on a beautiful beach on Phu Quoc island which is about 40 minutes from Phu Quoc International Airport. Fusion Resort Phu Quoc is a modern resort with a full-service spa concept and enchanting charm. This resort offers 87 rooms for tourists to have a luxurious holiday on the island. Stretching on the private bay of the coast of Phu Quoc, the series of the bungalow and villa thatched roofs bring luxury and class. Especially the idea of having breakfast at all times will help you to be completely free and relax during your vacation. All bungalows and villas have their own private pool for privacy and comfort most for visitors. Famiana Resort and Spa Phu Quoc is located on a private smooth sandy beach with the square of over 2 hectares. The resort stretches along the beautiful beach in the Gulf of Thailand. The resort is designed based on Asian cultural architecture combined with the graceful modern style to satisfy the needs of tourists. The resort owns 60 rooms with various types of rooms with different designs such as Famiana suites, villas, sea view rooms and garden view rooms. The entire resort area is surrounded by tropical flower gardens. Saigon Phu Quoc Resort and Spa impresses tourists by its white sandy private beach and cool garden. All in harmony with the modern architecture of the resort brings to the guests a warm and relaxed atmosphere. This is one of the first 4 star resorts in Phu Quoc, this resort comprises 100 bungalows and villas with bedroom, sofa bed, living room, shared space bar with dining room and kitchen. All rooms have the garden view and sea view which brings to you a cool poetic space. The resort has a restaurant with spacious seating space which specializes in serving European dishes. From the restaurant, you can witness the panoramic view of the beautiful sea while enjoying the delicious food here. Located right in the heart of Duong Dong town, Phu Quoc island, you just take 10 minutes driving from Phu Quoc Airport to get to the resort and enjoy the high-quality services and facilities here. 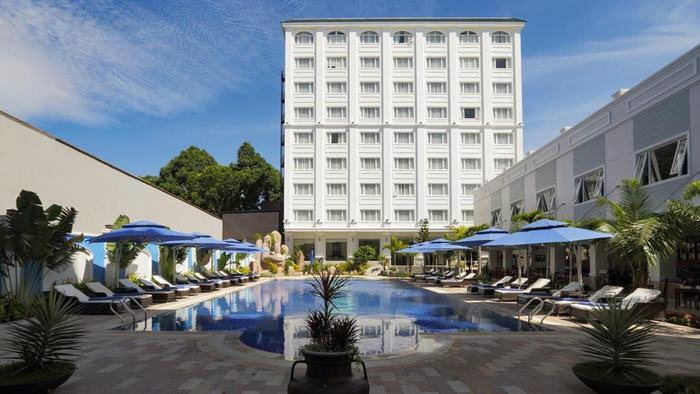 Ocean Pearl Hotel Phu Quoc is located near the center of Duong Dong town, it is convenient to visit the famous places such as Coco Bar and Dinh Cau night market. The nearest airport is Phu Quoc International Airport which is about 5 km. Ocean Pearl Hotel Phu Quoc is a combination of modern European style and Asian architecture. This is a 4-star standard hotel with modern facilities such as air conditioning, cable TV, mini-bar, safety box, wardrobe, working desk, etc. Besides that, clean and spacious bathroom, elegant with luxurious bathtub and shower offer you the best time to relax. There, we presented you with a selection of the best luxury Phu Quoc hotels. It is time to plan a dream beach vacation and head to a romantic Phu Quoc island getaway. If you have any questions about booking the accommodation in Phu Quoc, let’s contact us. Thank you!